I think I found the bug in the reported vs actual credit. Any WUs reported now should be correct. If not, I'm sure I'll hear about it. I am willing and able to help right now. Tell me how. At first I want to say that the presentation of the website is real good: clean and soft. The first day of the creation of a website everywhere on the world appears bugs. I call that day "the proof of fire". The webmaster is today stressed because he must control everything. Now you must count 2 or 3 days until every bugs are eliminated. I want to say to everybody stay quiet and not worry! If you see a bug then analyze that and send politely your observation. It is absolutely not necessary to increase the stress. Message 36 - Posted: 19 Apr 2018, 6:37:15 UTC - in response to Message 29. Still not getting any units sent to AMD Macs to work on, so nothing has been received or returned since the update. Not getting a warning about the settings being wrong since the ATI checkbox was added back to the preferences, but still no work reaching us. Message 38 - Posted: 19 Apr 2018, 6:53:16 UTC - in response to Message 36. It seems there are only Windows Apps available right now (https://boinc.thesonntags.com/collatz/apps.php) - which are running great btw. Not getting WUs on linux neither. I think it's due to the tesing phase and will be updated as soon as everything is smoothed out. Do a manual update from BAM then look your "event log" !!! You will understand why we get no any WU ! All "CPU only" WU finished immediately with"error while computing"
GPU WU seems to be OK, runs as before and got credits. Message 41 - Posted: 19 Apr 2018, 9:08:39 UTC - in response to Message 38. Message 42 - Posted: 19 Apr 2018, 9:11:50 UTC - in response to Message 24. Alot of yours seem to be ending in "computing errors" though. You may want to back off a bit and see if maybe 6 at a time is one or two too many with the new way of doing things. Message 44 - Posted: 19 Apr 2018, 9:55:40 UTC - in response to Message 24. Message 45 - Posted: 19 Apr 2018, 10:09:09 UTC - in response to Message 44. Looked closer after reading through threads. GPU tasks ok, CPU tasks, not so much, all failed. Toggling off CPU tasks for now. Message 46 - Posted: 19 Apr 2018, 10:20:29 UTC - in response to Message 42. Backed off to 2 per GPU. Checked stat's this morning. So many errors... all CPU - Collatz Sieve v1.30 windows_x86_64. Toggling off CPU tasks for now. GPU tasks running ok but my perception is they are taking longer to process. have already calculated over 300 without errors, but in BOINCstats I find no credits. Knocking off CPU for now. I'm seeing some strange behavior from a CPU task. Currently 19.876% progress, 14:23:54 elapsed, 1019d 10:05:20 estimated remaining. Do you need CPU tasks to check how well the GPU tasks work, or should I switch to allowing GPU tasks only? Using an Intel CPU, with Windows 10.. Message 50 - Posted: 19 Apr 2018, 14:02:22 UTC - in response to Message 36. There are only windows apps right now. I'm still working on the Linux/BSD Unix (a.k.a. OS X) apps. Message 52 - Posted: 19 Apr 2018, 14:10:38 UTC - in response to Message 49. 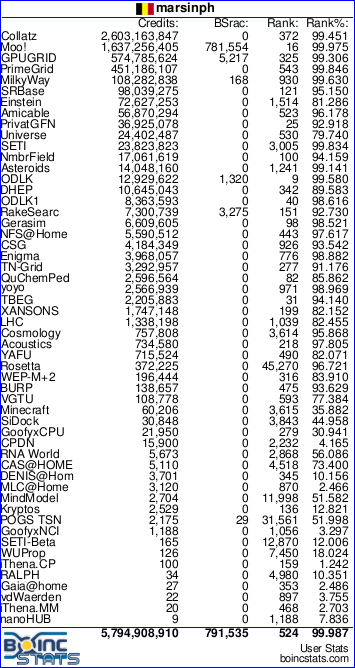 Evidently, the algorithm used by BOINC has gotten more complicated and more stupid. If it is 14 hours at 20%, the 5x14 = 70 hours and not 1029 days. The issue is that BOINC uses estimated floating point operations for all its calculations and Collatz doesn't use any floating point at all so all the estimates are fubar. Even the integer benchmarks are a joke since if you were to believe the output of them, an android phone is as fast as an i3 CPU when in reality it is 200 times slower. The same is true of GPUs. The number of stream processors drastically affects the speed but BOINC only allows the server to use a single value as the CPU to GPU speed difference. There's no way a GPU with 16 stream processors and 129MB RAM will have the same speed as a GPU with 2048 stream processors with 6GB RAM. So, the only thing to do now is to wait for several to complete at which time BOINC will show better estimates. Until then, elapsed time and percent complete are accurate so use those numbers to do the math and ignore the BOINC estimate. Message 53 - Posted: 19 Apr 2018, 14:29:37 UTC - in response to Message 1. Message 54 - Posted: 19 Apr 2018, 15:04:22 UTC - in response to Message 47. From this morning already 500.000 credits, visible here, but not on boinc stats. On SETIBZH, already 200.000 credits visible. The synchro between project and all other stats are not in real time. But not forget to unlink Collatz from your BAM and the connect again. The security is changed. It is already posted. But if you receive WU, i guess you already did. Of course not do if you have WU waiting crunching on your computer. Let finish all WU, disconnect Collatz from BAM, and reconnect with the same ID. You will nothing loose. Message 55 - Posted: 19 Apr 2018, 15:11:40 UTC - in response to Message 50. Knowing the problems also private. You do your best. All of us see it. Of course there are still problems, but you have only two hands and one brain !?!?!? Or perhaps you are Alien with four hands and two brains. ! You are one of the only admin between all BOINC projects who give info and follow up. Best regards and congratulations from Belgium.